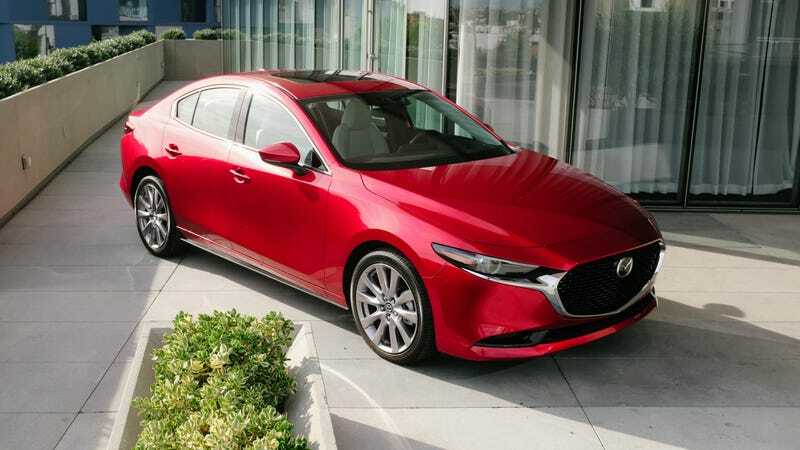 The first production models of the new 2019 Mazda 3 are already here, which I am about to drive later today. Before that, though, Mazda has announced pricing of its new compact, and it looks like you’re going to have to go with the hatchback if you want a manual. Before we dive in, I just want to note that Mazda has kindly flown me to Los Angeles to get behind the wheel of the new Mazda 3 today. I will only be driving the front-wheel drive sedan with the 2.5-liter Skyactiv-G engine (that’s not the new Skyactiv-X “Holy Grail” compression engine), and not the hatch either, but will try and get as much as I can out of the Mazda reps.
I’m only driving the 2.5-liter Skyactiv-G because, well, that’s the only engine option in the car in the U.S., for now. 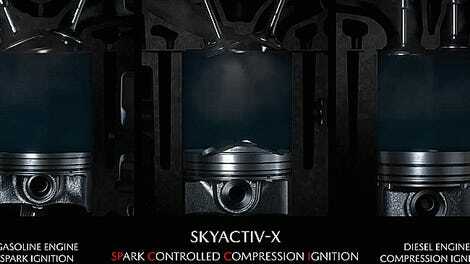 Mazda didn’t have an update on the timeline for the new Skyactiv-X engine yet, but it apparently will make it into the new car eventually. All 2019 Mazda 3 models, then, get 186 horsepower and 186 lb-ft of torque. The front-wheel drive sedan with an automatic will start at $21,000 in the U.S. The good news is the new car will hit dealer lots with the option of front-wheel drive or all-wheel drive, sedan or hatchback, with either an automatic or manual. The only catch, according to the pricing release sent out by Mazda, is that the manual is only currently available on the premium trim of the front-drive hatchback. Could be worse. We’ll have to wait a couple of months to see what the all-wheel drive Mazda 3 is like, and maybe even longer to get behind the wheel of a manual. My driving impressions of the front-wheel drive automatic sedan will be embargoed until early Sunday morning, so hold out for that. I am at least allowed to say that the car does indeed look incredible in the flesh. Our First Drive Review comes next week. In the meantime, what do you want to know about this thing?